Gyeonghui-gung Palace was the smallest of the Five Grand Palaces built by the Joseon Dynasty, because it was originally constructed as just a royal villa. Kings and royalties used to hold their daily excursions here. Constructed in 1617 and completed in 1623, Gyeonghui-gung Palace originally had 100 units of large and small palace structures, but were destroyed or damaged during the Japanese occupation; much like how the other palaces in Seoul suffered under Japanese tyranny. The Japanese completely destroyed Gyeonghui-gung in order to put up a school for Japanese citizens. Before the Japanese came, a total of ten kings resided in this Seoul Palace. Many years after the Japanese left and Korea earned its independence, the old site where Gyeonghui-gung stood was excavated by the Seoul Metropolitan Government in order to restore the palace’s major structures. The site was designated as a historic site in 1980. In 1990, the government initiated to rebuild or reconstruct the Five Grand Palaces. However, the capital city was undergoing tons of urbanization projects in the 1990s. With the on-going major urban developments in the area and the extent of damage from the decades of neglect, Gyeonghui-gung was reconstructed only partially, about 33% of its original grandeur. The restored palace was then officially opened to the public only in 2002. 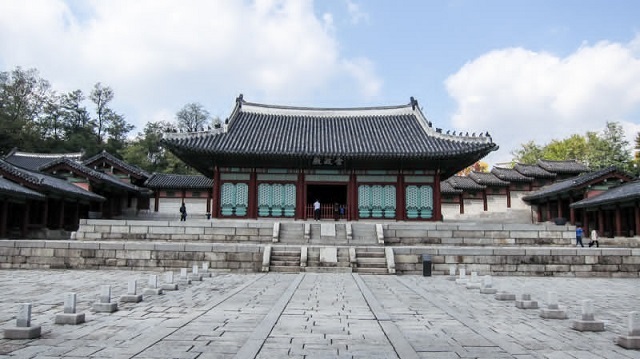 Standing today for visitors to see and marvel at are the main Heunghwamun Gate and Sungjeongmun Gate, which lead to the main palace structure. A flight of steps lead to the courtyard and the Sungjeongjeon, the main hall of Gyeonghui-gung Palace. It was at the Sungjeongjeon, the palace hall, where kings met with their subjects, entertained guests and conducted official ceremonies. Behind the hall is Jajeongjeon, the king’s living quarters. Also located within palace grounds is the Seoul Museum of History (or Seoul History Museum). One of its major attractions is the old Geumcheongyo Bridge in front of the museum. This bridge was part of the original palace but was buried by the ruling Japanese army. It used to connect to Gyeonghui-gung to Deoksu-gung Palace. The arched bridge was restored only in 2001. The history museum was opened on May 21, 2002. Its inside exhibits are divided into five zones, and yet there are also items on display outside the museum, along with the ancient bridge. The outdoor exhibition area features a water fountain, the tombstone of Prince Eunsin, a 1930s street car that operated on the Gwanghwamun area and 27 stone monuments, as well as a number of benches and rest areas for tired guests. Gyeonghu-gung Palace is open every day except on Mondays and January. It is open from 9:00 a.m. to 6:00 p.m. during the week and 10:00 a.m. to 6:00 p.m. on weekends and holidays. Admission is free for everyone. Visitors may reach it through five different subway stops: Line 5 at Gwanghwamun Station, Line 5 at Seodaemun Station, Line 3 at Gyeongbok-gung Station, Line 2 at City Hall Station and Line 1 at City Hall Station. Admission to the Seoul History Museum is also free.